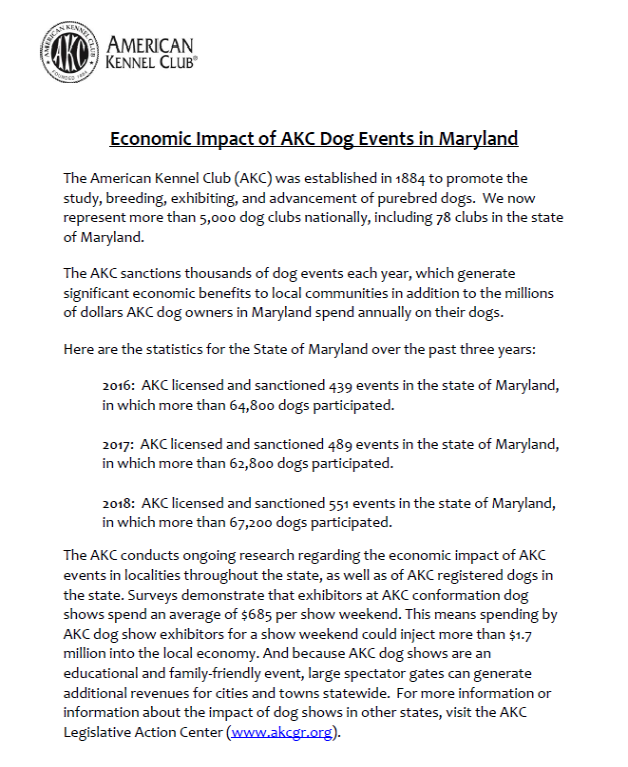 The American Kennel Club and the Responsible Dog Owners of Maryland, Inc. recognize that tethering is a practical and humane method for training and restraining dogs in a variety of circumstances. Dogs should never be tethered in a manner that could cause harm to them. Tethering is a common and responsible way to restrain dogs that do not respond well to other restraints (such as escape artists) or participate in activities that require acclimatization such as hunting, sledding and/or other obedience and performance events. Tethering may also be a responsible and appropriate option for handling dogs that are service dogs such as seeing eye dogs, dogs in training, and dogs that are being groomed or examined on a table. AKC opposes arbitrary restrictions on tethering, which can undermine the well being of dogs, responsible dog ownership, and safe training and recreational activities.